A busy day calls for a dinner thrown in the slow cooker earlier in the day, so I can get on with that never-ending to-do list. 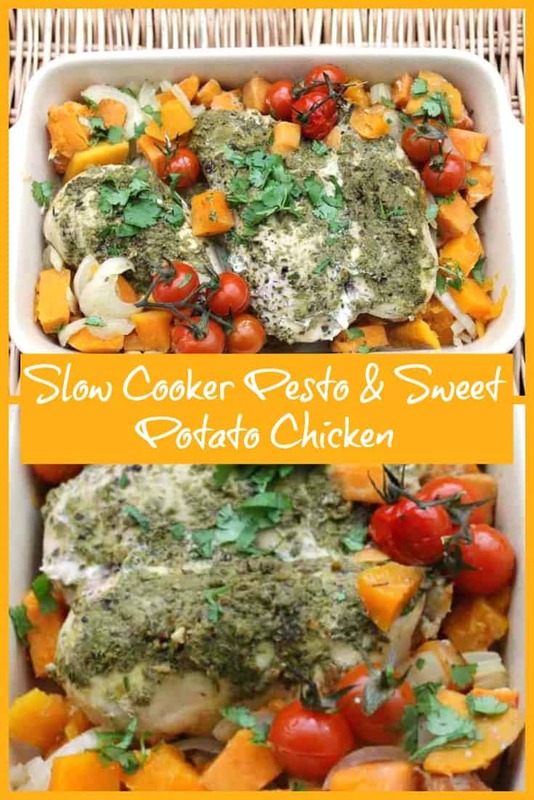 My slow cooker pesto and sweet potato chicken is simple to prepare, tastes great and gets in a few of your five-a-day too. It also fits in well with WeightWatchers Smartpoints or Slimming World. Cooked on low in the slow cooker all day, the chicken is placed on a bed of onions which holds it out of the cooking liquid (chicken stock). This means your pesto stays put and adds flavour to your chicken all day as it bubbles away slowly. Did you know you can make slow cooker dishes that looks this fresh and bright? It isn’t just stews and casseroles you can make in there you know! There’s really no need to put away your slow cooker when Spring arrives, when you can make fresh and healthy dishes like this. The convenience of a slow cooker means I use mine all year round. I’ve got loads of recipes like this in my recipe archives – you can see them all in my slow cooker archives. You might like my slow cooker lemon and herb chicken with asparagus and my slow cooker chicken with Mediterranean roasted vegetables. These bright colours just make me happy for the arrival of Spring and the warmer weather that will hopefully be on the way soon. If you can enjoy fresh flavours from the slow cooker there is no need to abandon it until next winter I reckon. 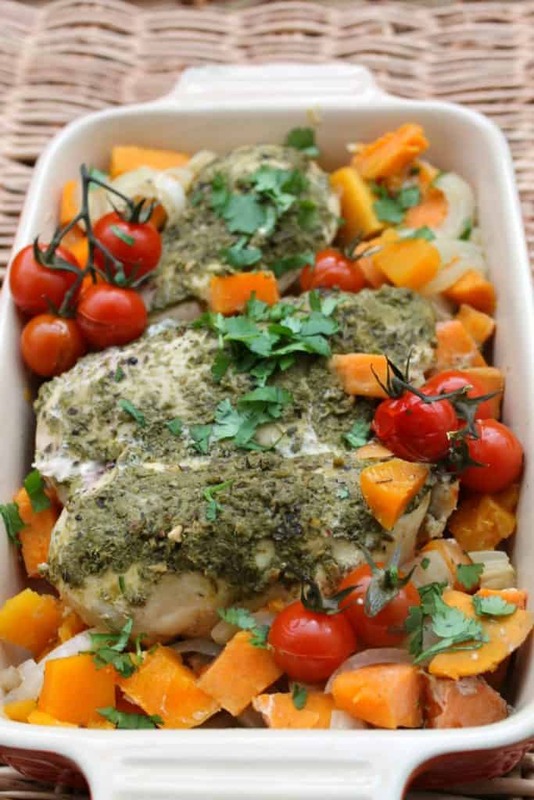 Pin this recipe for slow cooker pesto and sweet potato chicken for later!! Place the chopped onions in the base of the slow cooker. Put half of the sweet potato and butternut squash in with the onion. 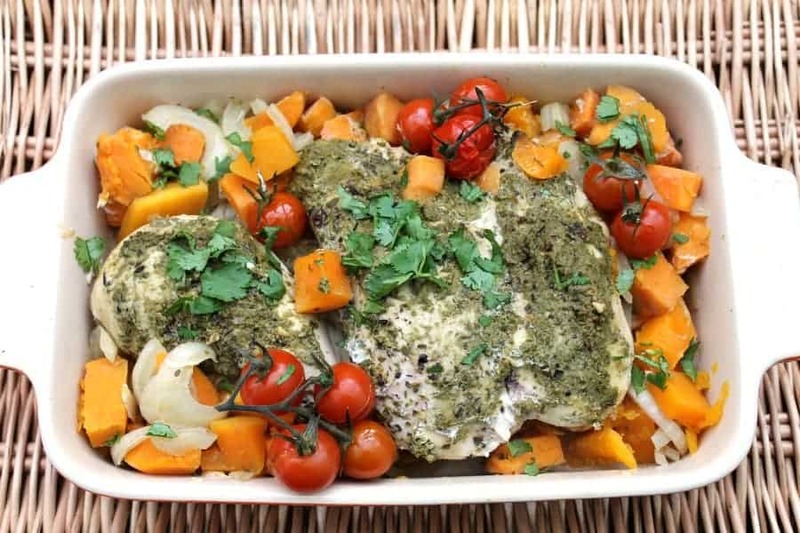 Spread 1 teaspoon of reduced-fat pesto over each chicken breast, season with salt and pepper and sprinkle over the oregano. 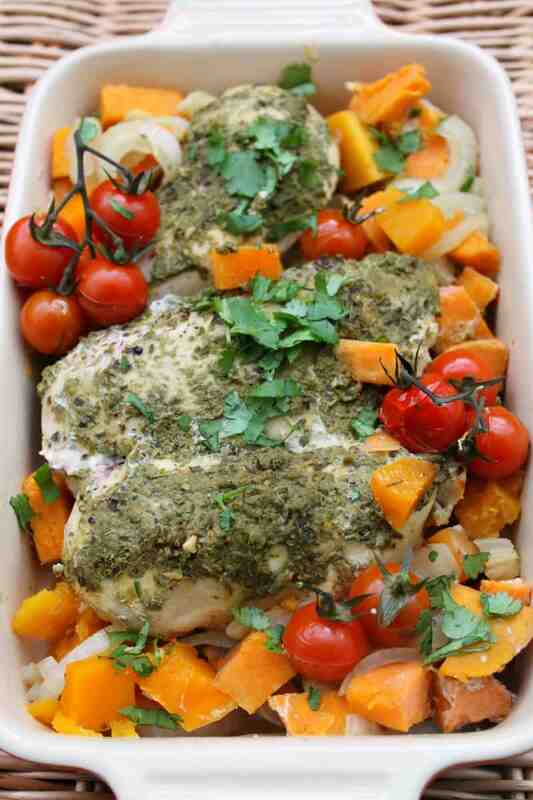 Put the rest of the sweet potato and butternut squash, and the cherry tomatoes, around the chicken breasts. Measure the boiling water in a jug and add the chicken stock melt. Stir to melt it and then carefully pour the stock under the chicken in the vegetables. Check the chicken is cooked through. Using a large slotted spoon, lift the chicken breasts out of the slow cooker and place them in a serving dish. Put the cooked vegetables around the chicken and serve. Delicious with crusty bread, pasta, rice or couscous. How long would you cook for on high? Hi Astrid. I’d cook this for 3-4 hours on high, hope that helps. What does “one chicken stock” mean please? How much? Hi there it says one chicken stock melt or stockpot. So one cube or stockpot whichever you prefer to use. Hi Jackie, sorry I don’t count calories but you can use an app or site like MyFitnessPal to calculate it, taking into account the specific brand of pesto you use and how many servings you have. On weight watchers this is around 6 Smartpoints per serving I believe, it is a healthy low fat option. This looks delicious Lucy, I like the idea of pesto with the chicken. A great meal to try for spring and it’s healthy too. That looks so bright and fresh! 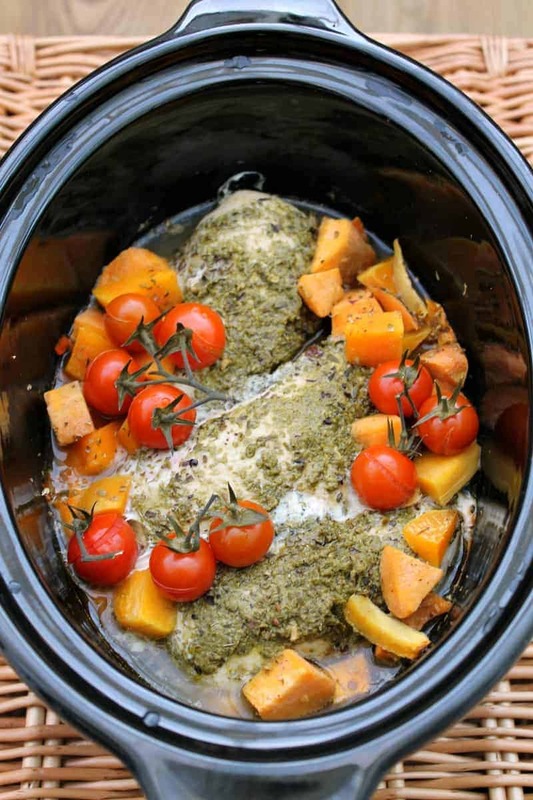 I must admit I am guity of using my slow cooker pretty much only for autumn/winter stews. This looks like such a lovely spring/summer dish. I love roasted squash. This looks just the kind of thing I should be cooking as I’m about to embark on Slimming World *takes deep breath* so I’ll def be bookmarking this for my healthy but tasty list!